Social Shopping on Your Phone? You're here » Home » Social Media Marketing » Social Shopping on Your Phone? Shoppers could spend more than $119 billion via mobile phones by 2015. The myShopanion iPhone app is launching at DEMO to capitalize on these market opportunities and help bridge the gap between online and real-world shopping. The myShopanion app is designed to be a consumer’s best friend and serve as a companion app for shopping, as the name implies. App users can search for products by barcode scan — the app integrates RedLaser’s popular scanning technology — or name, and users can tap their social network friends to help them make better-educated purchase decisions. myShopanion draws on a number of third-party data providers to return detailed information on each product, including product specifications, merchant prices and consumer reviews. We know from RedLaser’s success (the app has been downloaded more than two million times), that myShopanion has the potential to resonate with shoppers looking for a good deal. The application’s claim to fame is its ability to connect the dots between comparison shopping and social media. Right now, app users can use the app to share via Twitter and Facebook the products they’re researching and gather feedback from friends. But even Suchet admits it’s merely a hackneyed approach for soliciting time-sensitive social media feedback. He promises the ability to send push notifications to individual friends for more immediate feedback in a future release. Still, the application is inherently social in nature and encourages members to share their scanned and searched-for items to incorporate friend participation in the comparison shopping experience. 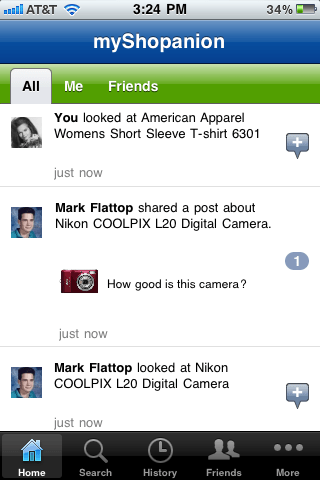 Shared activity is highlighted in the feed area of the app, where users can add comments to the products their friends are checking out. 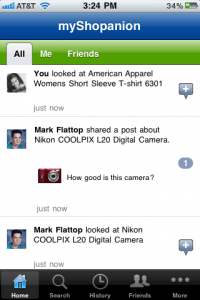 The app also connects to Facebook and Twitter to help users find and add friends from those social networks. myShopanion is made by Zappli. The company has raised an undisclosed amount from angel investors in the hundreds of thousands of dollars range and may raise additional funds within the next few months. Headline: Social Shopping on Your Phone?